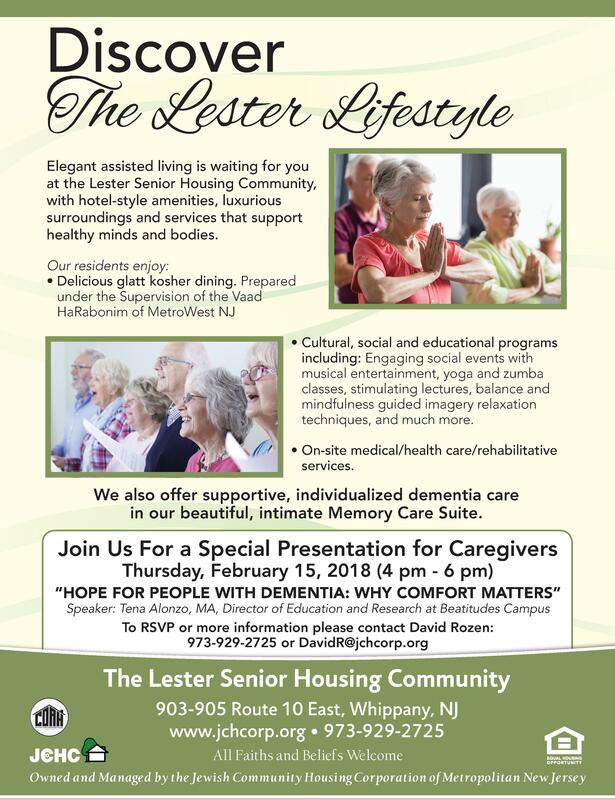 WHIPPANY, N.J., January 24, 2018	(Newswire.com) - ​The Lester Senior Housing Community in Whippany, N.J., will host a free caregiver workshop on dementia care titled “Hope for People with Dementia: Why Comfort Matters” on Thursday, Feb. 15, from 4-6 p.m. The presenter will be Tena Alonzo, MA, director of education and research at Beatitudes Campus in Arizona and a noted leader in dementia care. Attendees will learn about the Comfort Matters™ approach to memory care, which emphasizes a highly personalized, holistic perspective that puts each individual’s needs and well-being first. As part of her talk, Alonzo will share helpful tips and valuable resources for those caring for loved ones with cognitive impairments. There will also be a chance to tour the community’s homelike Memory Care Suite and learn more about the activities and services there that promote comfort while also fostering opportunities for socialization and engagement. To reserve a seat at the workshop, contact David Rozen at (973) 929-2725 or davidr@jchcorp.org. 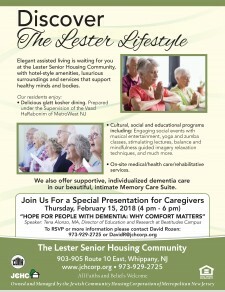 The Lester Senior Housing Community is located at 903-905 Route 10 East on the Alex Aidekman Family Jewish Community Campus. It is one of four senior living communities owned and managed by the Jewish Community Housing Corporation of Metropolitan New Jersey (JCHC). For more information about the Memory Care Suite, respite stays, the Friends & Neighbors program for area seniors or the community’s independent and assisted living options, contact David Rozen or visit www.jchcorp.org. Founded in 1983, the Jewish Community Housing Corporation of Metropolitan New Jersey (JCHC) owns and manages more than 470 apartments in four buildings for older adults in Morris and Essex counties in northern New Jersey. The non-profit organization offers seniors a range of options in terms of services, amenities, location and cost, all within a traditional Jewish environment. The JCHC provides housing, programs and services for the independent elderly as well as those who need assisted living. For more information, go to www.jchcorp.org.